Photos of a supposed next-generation MacBook Pro chassis that surfaced Tuesday appear to support recent predictions that Apple is planning to drastically revamp the laptop’s design. The leaked photos show an OLED touch bar, four USB ports, and no MagSafe connection. The images, sent to Cult of Mac by an anonymous source said to be within Apple’s Chinese supply chain, claim to be the first “spy shots” of Apple’s next-generation MacBook Pro. As seen in the picture above, the aluminum laptop chassis follows traditional MacBook design, but lacks a top row of function keys normally found on all Apple keyboards. 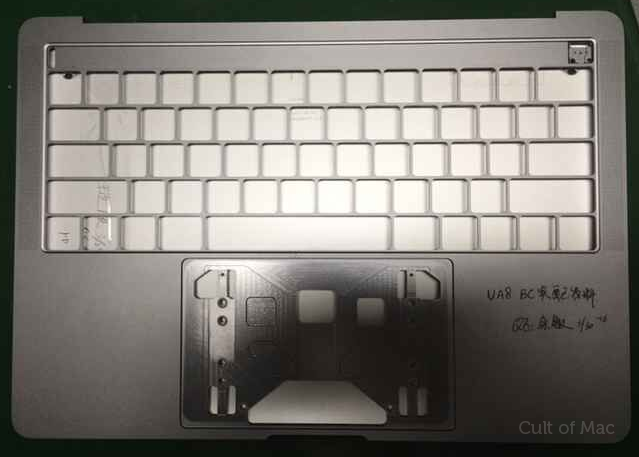 In their place is a solid groove and what looks to be space for a connector or controller module, suggesting the cutout will be used for an OLED touch bar, which was first reported by KGI analyst Ming-Chi Kuo last week. Side views of the purported MacBook Pro part show what seems to be four rounded portholes matching the size and shape of the USB-C standard. Apple is rumoured to include USB-C into its upcoming Pro laptop, which may possibly used for charging the device. MagSafe has long been Apple’s standard means of recharging, but the format was deleted in favour of USB-C when the 12-inch MacBook with Retina display launched. The headphone jack has also been relocated to the right side of the chassis, while speaker grilles flank both ends of the keyboard. Apple’s current 13-inch MacBook Pro hides its speakers underneath the keyboard. Apple is rumoured to be eyeing a fourth quarter release for the redesigned MacBook Pro, to be preceded by a new 13-inch model for the MacBook with Retina display line.